Airbus US outpost starts VTOL taxi flight tests » UAV DACH e.V. 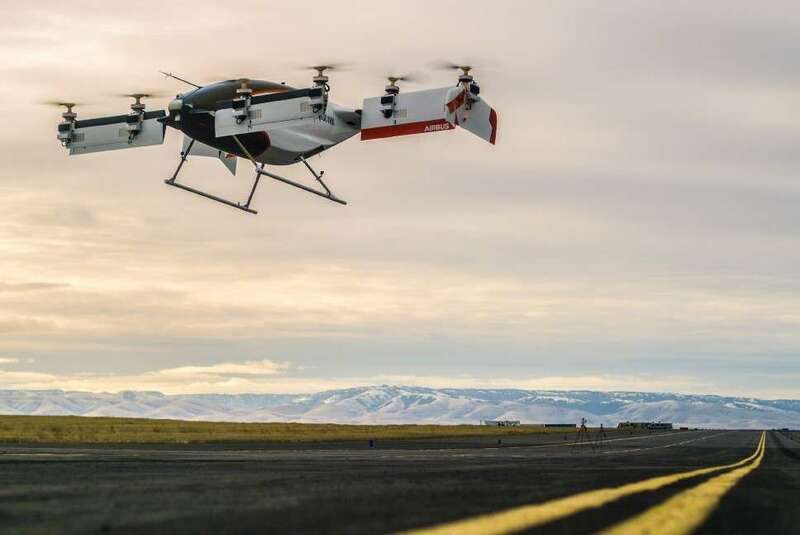 Airbus’s Silicon Valley-based advanced projects unit A³ has started flight tests with an autonomous vertical take-off and landing aircraft that has been designed to serve as an air taxi for a single passenger. Called Vahana, the electrically powered aircraft features eight rotors that are installed on four tilting wings around a passenger cabin on skids. Airbus says the “fully self-piloted” aircraft took off for a first hover flight of 53s on 31 January up to height of 5m (16ft) “before descending safely”. Despite the short duration, the test represented a “great accomplishment in aerospace innovation”, states project executive Zach Lovering. He adds: “Vahana took a concept sketch on a napkin and built a full-scale, self-piloted aircraft” that has completed its first flight in “just under two years”. The trial was conducted at an airfield in Pendleton, Oregon – which is dedicated to testing unmanned air systems. The aircraft subsequently completed a second hover flight, Airbus says. Tilting the wings to transition to forward flight will be covered in later tests, the airframer notes. Vahana is one of two air taxi programmes being undertaken by the manufacturer: Airbus Helicopters is also leading the CityAirbus project with a first flight due later this year. UAV DACH: Beitrag im Original auf http://www.flightglobal.com/news/articles/airbus-us-outpost-starts-vtol-taxi-flight-tests-445471/, mit freundlicher Genehmigung von Flight Global automatisch importiert, Der Beitrag gibt nicht die Meinung oder Position des UAV DACH e.V. wieder. Das Original ist in englischer Sprache. Der Beitrag gibt nicht die Meinung von UAV DACH e.V. wieder. Der Beitrag gibt nicht die Meinung von UAV DACH e.V. wieder.